You know those trends that you like on others but can’t ever seem to get right on yourself? That’s me with this denim on denim business. You may recall that I wrote a post on it back when I very first started this blog. (See it here, if you so desire.) I mentioned that I wanted to avoid looking like a farmer or Britney Spears in the late 90s. And after searching Pinterest and other blogs, I thought I had found a way to do just that. 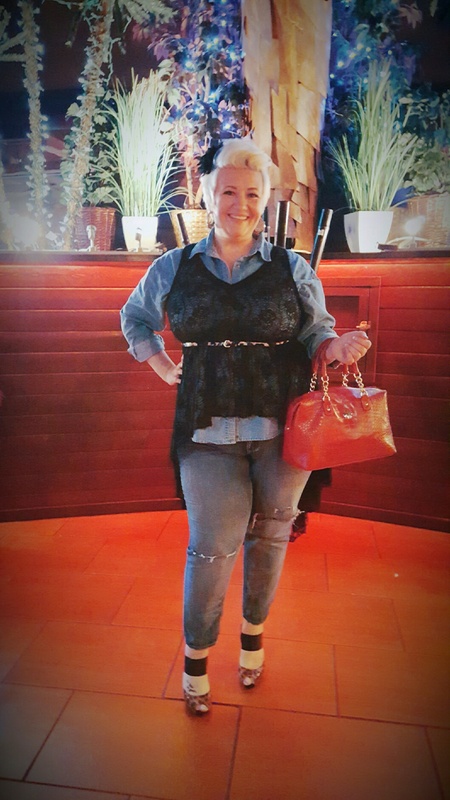 Last Thursday was the day I busted out my denim top and jeans…together, at last. In my desperation to find something to break up the sea of blue, I stumbled upon this Torrid Top from earlier in the summer. I hadn’t really thought of wearing it over long-sleeves before but I was willing to try anything that morning (except pure denim on denim). Fortunately, I had also picked up a much-needed, thin, leopard belt at Ross the day before so I threw that on as well as my leopard heels and stood back from the mirror to assess the damage. Whaddya know?! I didn’t hate it. I love it when cute looks are born out of desperation on a rushed work morning. It doesn’t happen often but that just makes me appreciate it even more when it does! I’ve never really liked the denim on denim look but I think you found a perfect solution with the black lace to break the outfit up so that the denim is your supporting background and the eyes are drawn to the details of the belt and lace. Great job!